and another french table as well...and some toss pillows to go on the settee. was wanting Asian inspired items...huh? done in 30 minutes, and one happy customer! You can see how it looked in its black with gold~very English traditional. many things~and getting ready for new ones! This is an old Tabloid table~I dreamt of a finish that felt Moroccan. Looking to get that verdi-gris look with tarnished and turned copper. reddish brown paint to look like mahogany. back to reveal gold and the red painted wood structure beneath. Finished with clear and dark waxes. came in as well~each back splat has a different stenciled pattern. wonderful country chairs~signed by the Hitchcock company. Each chair is $80~check online and you will see this is quite the deal! 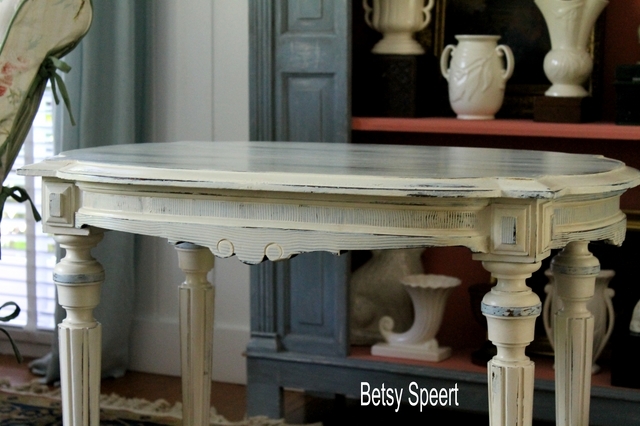 painted on her debut using Chalk Paint™ by Annie Sloan. It might be the nicest piece I have seen~so don't miss it! Click on the pic to link to the post. Its as pretty as I had hoped it would be! Who wouldn't want to go in this shop? adjust the draperies as they blocked out the lettering. and I agreed...they were lost hanging in the back of the shop. So up they went~Colin hung them at just the right height. Its delicious and frenchy and very cottagey! and it is a pleasure just walking through these doors! The customers love the shop, and so do we! often that is when I find these dreamy ideas are the right ones. you can't believe you couldn't think of them when awake? what color they want to paint their drab pieces! Here they are finishing up~a happy crew. will come for the July workshop instead. and I hang this sign in the door. Debbie did a graphic transfer on a small vanity bench. a good blogger~so here are the finished pieces. Jackie's jewelry box in Antoinette all shabbied up! check the shop link on the blog for details. I'll be doing a "Ladies Night at the Auction" soon! paddle in your lap, and ultimately and go home with a treasure? and they aren't all about painting. my big fun of the day is happening right this very moment! Have you ever seen a Side by Side? But before we get into all that, a Side by Side is a Secretary desk with a bookcase, side by side. Its a very smart design I think~and would make a perfect piece of furniture for today's world. you can tuck it away when you shut the desk. The desk has old world details~and little key holes...they had key holes on everything!! What do you suppose they had to lock up in these old desks? Its funny to think about...but they are attractive decorative details that speak to another time. I lined the back of the desk with the seagreen metallic taupe damask wallpaper. blue green color I mixed up~this piece looks really amazing in person! so you will have to trust me on this. This is carved wood~not an applique stuck on made out of resin or plastic. a slight shimmer on some of the carved areas. Please don't write me and tell me I ruined a piece of nice furniture. I am into painting furniture and I won't apologize. You can not paint your furniture and I am cool with that. so I came up with the Old Ochre and the washes. Can't you see this desk in a kitchen or a family room? Looking all splendid but really doing double duty. or grey washed baskets holding hidden supplies. and a tiny little whatnot shelf to put something special on display. So you see why I fell in love, right? Pretty Store Signage~windows are done! My first Annie Sloan™ Workshop! Decoupage Tole Tray Table and Workshop!